Global Hospital Light Market – Global Industry Analysis and Forecast (2018-2026) by Product, by Technology, By Application and By Region Type. Home » Reports » Electronics » Global Hospital Light Market – Global Industry Analysis and Forecast (2018-2026) by Product, by Technology, By Application and By Region Type. 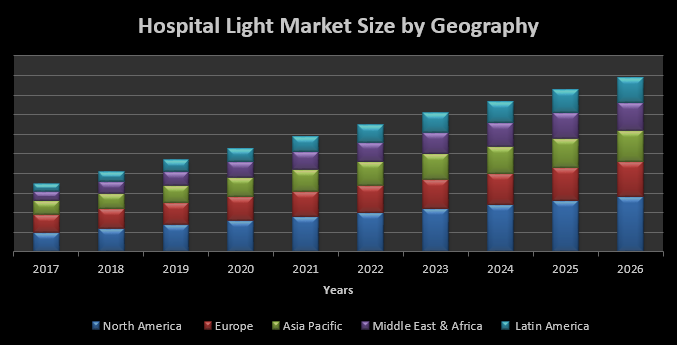 Global Hospital Light Market was valued US $6.04 Bn by 2017 and is estimated to reach  US $10.6 Bn by 2026 at a CAGR of about 6.5% during a forecast period. An objective of Hospital Light market is to grow Hospital buildings that’s vary enormously and the lighting has to be suitable both for the very busy medical staff and the prone, mainly inactive, patients. Most complex hospital buildings are lighting designer is ever likely to face. Hospitals are the buildings that truly operate 24/7 every day of the year. Thus energy consumption is a very significant factor for running costs of hospitals. Apart from a National Health Service document on lighting and color, Society of Light and Lighting LG2 'Hospitals and Healthcare Buildings 2008' most often quoted a guidance. Department of health in UK endorses LG2 for guidance on hospital lighting. Based on Product type, Hospital Light Market is shattering into Troffers, Surface-mounted lights, recessed lighting, and surgical lamps. Which also includes emergency lights, exit lights, and step lights, commonly used lighting system. Surface mounted system provides the optimal distribution of light in installed area. Thus accounted hold highest global share revenue in 2017. Now a days, increasing adoption of LED-based recessed down lights use in operating rooms and LED-based recessed troffers use in imaging rooms and diagnostic. Thus recessed lighting system is expected to be the fastest growing shatter during the forecast period. Based on Technology type, Hospital Light market can be fragmented into Fluorescent, LED, and Renewable Energy. Adopting LED lighting technology has estimated to lead the market segment around 40% of revenue in 2017, globally. Thus attribute benefits such as long service life, high level of reliability uniform , and quality of light for many application areas including stairs, waiting rooms, pantry area, and lobbies. In terms of geography Hospital Light market is segmented into North America, Europe, Asia Pacific, Middle East & Africa, and Latin America. North America is expected to dominate Hospital Light market over the forecast period. North America could top the charts in terms of revenue growth around 38%. APEJ is envisaged to maintain CAGR of 6.2% during the forecasting period. However MEA and Europe exhibit a slothful growth in the near future. 12.10.5. Rest of Asia Pacific. 13.10.3. Rest of Middle East & Africa. 14.12.1.3. Rest of Latin America.